Quanta's Board of Directors is one of two main units in corporate governance structure. According to the Company's regulations, five to nine directors are in the Board of Directors. Shareholder director nomination is adopted as the electoral system, and directors shall be elected from the nominators. The aggregate shareholding percentage of all of the directors of a securities firm shall comply with the laws and regulations. There are even seats of directors (including three independent directors) in the current term, and the Audit Committee is established; these three independent directors serve as ex officio member performing Board of Supervisors' duties. The aggregate shareholding percentage of all of the directors of a securities firm shall comply with the laws and regulations. Quanta's liability insurance covers all the directors, and the insurance information shall be presented in the Board of Directors. All current members of the Board of directors possess abundant corporate management and academic experience; most of them are still engaging in relevant professional fields. In accordance with the regulations of "Directions for the Implementation of Continuing Education for Directors and Supervisors of TWSE Listed and TPEx Listed Companies", they shall participate in relevant training programs and obtain its certificates. The three independent directors are: Dr. Wei-Ta Pan, President of Soochow University; Mr. Qi-Zhi Lu, certified public accountant, and Dr. Pisin Chen, professor of National Taiwan University. Board meetings are convened at least once every quarter, with a total of eight board meetings convened in 2017. Quanta discloses Board of Directors' significant resolutions on Market Observation Post System and the official website of the Company. To implement corporate governance, fortify supervisory functions and improve management skills, Quanta draws up "Rules and Procedures of Board of Director" in accordance with "Regulations Governing Procedure for Board of Directors Meetings of Public Companies ". Board of Directors' occupational competency and operations shall comply with relevant regulations and laws, and they shall supervise company's managers and be responsible for corporate overall business operations. If any resolution involves the interests of Directors or of the Company, responsible directors shall follow the principles of interest avoidance, avoiding according to law stipulation and no vote shall be taken, to protect the interests of the Company and its shareholders. After the audit reports and follow-up reports are submitted for approval, the internal audit supervisors shall deliver relevant documents to independent directors for review at the end of following month succeeding the completion of auditable items. If independent directors have intention to understand further the audit process and tracking results, they are allowed to contact with audit executives at any time. Internal audit executives shall participate in Board of Directors to report auditing operations and be ready for answering interpellation. 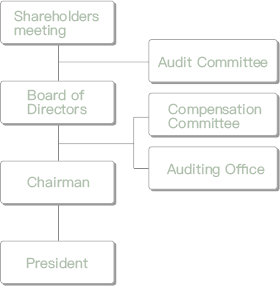 The Audit Committee serves as another major unit of Quanta's corporate governance structure. On March 31, 2016, the Board of Directors passed resolutions to comply with "Audit Committee Charter", stipulating main objectives, such as the supervisory adequacy of corporate financial statements, certified public accountant's appointment/ dismissal, independency and performance, corporate internal control's effective implementation, compliance with relevant laws and regulations by the Company, and management of the existing or potential risks of the Company. The 1st Audit Committee, replacing the original supervisory functions, was established on June 24, 2016. Three independent directors serve as ex officio members: Mr. Wei-Ta PAN was selected as the president of meeting and committee coordinator. A total of four meetings were convened in 2017. For the purpose of promoting the Company’s sound management, Quanta has the Company’s internal control system designed and established in accordance with the “Rules Governing the Establishment of Internal Control System by the Public Companies” and the consideration of the Company’s overall operating activities. The Company’s internal control system is resolved in the board meeting to reasonably ensure operational effectiveness and efficiency, the reliability of financial statements, and the compliance with the governing regulations. The Auditing Office is formed in accordance with the law and it is responsible for the effectiveness and integrity of the internal control system enforcement as well as for the persistent and ad hoc supervision of an audit. The Auditing Office is to have the annual auditing plan drafted up for the approval of the board of directors in advance. All audit reports shall be reviewed by both independent directors and also members of the Audit Committee. Internal audit executives shall participate in Board of Directors to report internal auditing operations and to prepare audit reports. Quanta Computer has been without any significant internal control nonconformities identified and has had its internal control system implemented in 2017. Quanta’s remuneration policy is based on the performance. According to this policy, remuneration for upper level management officers is directly related to economic performance and partially related to environmental and social performance. For details, please refer to the information about to management officers in Quanta Computer Incorporated’s annual report, Chapter III - Corporate Governance. The Remuneration Committee of the Company is with a total of three members: Mr. Wei-Ta Pan, Mr. Qi-Zhi Lu and Mr. Pisin Chen. Mr. Wei-Ta Pan was selected as the president of meeting and committee coordinator. Stipulation of the “Remuneration Committee Charter”: The company resolved its “Remuneration Committee Charter” on August 31, 2011 in accordance with Article 14-6, Paragraph 1 of the Securities and Exchange Act as well as the “Regulations Governing the Appointment and Exercise of Powers by the Remuneration Committee of a Company Whose Stock is Listed on the Stock Exchange or Traded Over the Counter,” announced by the Financial Supervisory Commission. Committee member term limits are the same as for the appointing Board. First term members’ term limit: September 30, 2011 to June 17, 2013. The members of the second term were reelected the same as the first term on June 24, 2013, with a term of 3 years, starting from the date of appointment until June 23, 2016. The members of the third term were reelected the same as the second term on June 24, 2016, with a term of 3 years, starting from the date of appointment until June 23, 2019. However, owning to personal reasons, member Jing Lin submitted his resignation on January 4th 2017. The Board of Directors decided to hire Mr. Wei-Bin Li as the new member on March 28, 2017; his term started from the date of appointment until June 23, 2019 and his termination date is the same as that of Board of Directors. A total of 4 meetings were convened in 2017.